Need engine bearings for your Big block or Small block Chevy race engine? At RMRE we stock a variety of bearings. From simple HD (Heavy Duty) or HXN (Heavy Duty Extra with Clearance and Narrowed) to HXNDC (Heavy Duty, Extra Clearance, Narrowed, Dowelled and Coated). Contact our Parts Department for assistance with your application. We offer a wide selection of coated and non-coated bearings. We also have 55mm, 60mm and 65mm roller bearings. 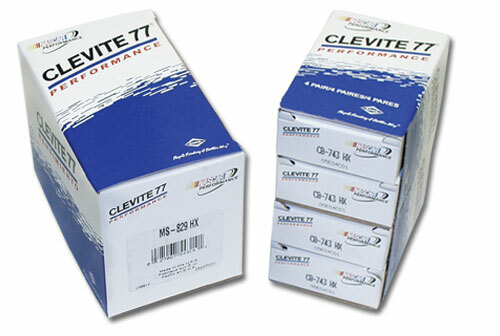 We sell Clevite 77 cam bearings, as well as other leading brands. We also have IKO and INA roller cam bearings. We have coated and uncoated main bearings available from the leading brands, including Clevite 77. With our wide selection, we definitely have the right bearings for you. You can choose from our extensive inventory of quality rod bearings from Clevie 77, and other brands. We have both coated and uncoated bearings, as well as, narrowed and dowelled. Call us today so we can find the rod bearings that are right for your application.